Like I said in my last Spring (Half Term) 2014 update, I am now doing my 'SEN Updates' six times a year at the beginning of every term/half term as I have been told that this helps more people. As I always say, I know how busy everyone is, so please feel free to read just the sections that are of interest to you or read everything. The choice is always yours. Typical, isn’t it? Soon after I wrote my Spring (Half-term) update, the Children and Families Bill received Royal Assent to become the Children and Families Act 2014 and is now finally law. However, it has still not yet been brought into force, although the plan seems to be to bring it in from 1 September 2014. If you have been reading my updates previously, you will know that the initial draft Code was heavily criticised following its consultation at the end of last year and has therefore now been rewritten/restructured. This new revised version still needs to be laid before/debated by both Houses of Parliament who need to approve it but I believe it is hoped that it can be issued in its final form in June 2014. It doesn’t take a genius to work out that, either way, it is not a satisfactory state of affairs. Either the new legislation will be delayed or the SEN Code of Practice will only be brought into force just before the summer holidays and there will only be effectively a month or so for some people to prepare (as Schools/Colleges etc. will break up for the Summer holidays at some point during the July 2014). Nothing is perfect at first and we now just have to be pragmatic and make the best of what we get although we will need to be prepared to ‘tweak’ things as we go along. Unfortunately, there will be mistakes; however, we need to actively try to minimise any mistakes and learn from them if/when they do happen. The best way for this is, I believe, to make sure we are as prepared as possible from early on. I have talked extensively about the contents of the new law in my previous updates. Although things are now fixed in the ‘primary’ legislation (the Children and Families Act 2014), the ‘secondary’ legislation (the Regulations) and ‘statutory guidance’ (the SEN Code of Practice) are still not yet finalised. They always say that ‘the devil is in the detail’ so I am going to wait a little longer to find out how things are going to look in reality rather than waste time now looking at how things may be in theory. 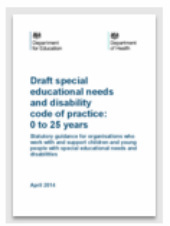 That being said, the Council for Disabled Children (CDC) have helpfully written an overview/briefing of the Act which is I believe going to soon be available on their website. Contact A Family have also prepared a one-page document called 'Top Children & Families Bill Myths' and Ambitious About Autism have produced a more detailed guide called 'What You Need To Know'. Parents having to battle to get the support their child requires. Lower expectations for children with SEN. There will be a clear focus on including children/young people/families in the whole SEN process (which I believe can only be a positive thing). There will be more focus on resolving disputes locally/amicably (which should mean that there will be less disputes). There will be more responsibility for identifying and supporting pupils with SEN in the classroom (there will also be a clear responsibility of every teacher to teach every pupil – whether or not they have SEN). There will be a more simplified single category of school based provision (known as ‘SEN Support’ rather than the ‘School Action’/’School Action Plus’ we currently have). There will now be ‘Education, Health & Care’ (‘EHC’) Assessments/Plans that can cover children from both to 25 years (but there is no presumption that this will happen as an EHC Plan will only continue until the ‘outcomes’ in it are achieved). EHC Plans will replace Statements/Learning Disabilities Assessments (‘LDA’) (i.e. there will not be any further Statements/LDAs issued). Within three years all existing Statements/LDAs will theoretically change to EHC Plans (I say ‘theoretically’ because there is no guarantee that if a child/young person has a Statement/LDA they will automatically get an EHC Plan). There will be a clear requirement for ‘joint commissioning’ between Education, Health and Social Care Agencies (i.e. there must be coordinated assessment/provision). There will be a wider choice of schools/placements for children and young people with SEN.
Young people with SEN should no longer ‘fall off the cliff’ when they are Post-16/Post-19 (as there will be more options to them for education/training). So, overall, the new system should be better for everyone, right? As I say, one of the main problems has always been that when young people reach the end of their secondary schooling, either at Year 11 (when they are 16), Year 13 (when they are 18) or even Year 14 (when they are 19 - if they are in a special school) they literally ‘fall off the cliff’. What I mean by this is that, if they do choose to stay in education, they are then expected to go to a Further Education institution but without the same support. They may even receive a ‘Learning Disabilities Assessment’ (‘LDA’) but that does not protect them legally as much as a ‘Statement’ does; or, worse still, they could end up in or out of the workplace without having really finished their ‘education’ first. As I have done what I do for nearly 20 years now, I have had the benefit/misfortune of having represented some children/young people right through from nursery age to when they eventually leave school. It saddens me greatly sometimes that all the good work that has been done with them over their years of schooling (which was often very hard fought for) is often lost soon after they leave school. I truly feel for these young people/their families but have always been very limited about what I could do for them. I am therefore really pleased to say that, with the new SEN Framework now going up to 25, I am now also going to be advising and representing parents/young people over the age of 19 (don’t worry, I am still helping children/parents during their early years/primary/secondary schooling!). In fact, I have already started to do this in a small way as I have begun helping some families of young people who are already over 19 or who are coming up to 19, in preparing for the forthcoming changes to the SEN framework. What happens to a young person who has already turned 20 (perhaps only in the academic year 2013/14) who used to have a Statement/LDA but who longer does and now needs to ‘come back into the system or have an LDA transition to an EHC Plan’? I’m afraid it is all a bit complicated. In fact, even those young people who are 18 or below with a ‘Statement’ or ‘LDA’ but who will be reaching the end of their schooling/placement from July 2015 or the next few years need to be prepared. The past few months have been very busy for SEN events as well as for me personally. First there was the Jordans Annual SEN Law and Practice Conference on 5 March 2014 where I spoke for the 10th time! (I am delighted to have already been booked for next year's conference on 5 March 2015!) 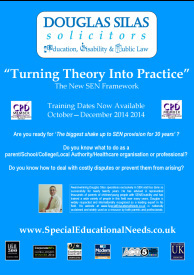 This is widely regarded as the annual event for professionals concerned with SEN for parents/schools/LAs every year. We were provided there with more details about the new legislation and how the Special Educational Needs & Disability Tribunal, amongst other things. There was then the Optimus conference on 11 March 2014 for SENCOs; the Kyra conference on 18 March 2014 for schools (where I gave a keynote speech); the Hesley Group's conference on 2 April 2014, aimed at all SEN professionals (where I chaired/spoke) and the Council for Disabled Children’s conference on 23 April 2014, aimed at anyone involved in SEN. The next few months are not going to be as busy. But there still is the Westminster Education Forum on ‘Special Educational Needs and Disabilities – Implementing the Children and Families Bill’ on 8 May 2014 in London, aimed at anyone involved in SEN. One of the keynote speakers will be Alison Boulton, the Chief Executive of from Natspec (the Association of National Specialist Colleges) and you will also hear from many other people (including me) with their views/concerns about the new SEN framework. 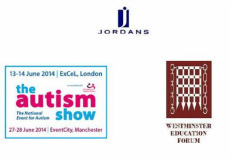 There is also the (usually very well attended) ‘The Autism Show’ in London on 13/14 June and in Manchester on 27/28 June 2014. I am as guilty as everyone, as I have been approached many times now to speak/provide training to many different education/SEN professionals/organisations/schools/LAs and talk about the new framework. But I feel that there now needs to be a shift of focus from the 'theory' to providing practical advice. I have done things in this way as I have also noticed in the past year that, although those already involved with SEN (either personally or professionally) already know a bit about things, there is now also a lot of interest in the forthcoming changes, not just from those people/professionals involved in Schools/‘Education’‘ but also from those people/professionals working in Colleges/FE establishments or 'Health’ and ‘Care’ sectors. I often now joke that it took many people 10-20 years to get used to what to do with our current system so I hope that my training will help as many people as possible to not make the same/similar mistakes. Although people are welcome to come to any of the training days as they will be similar, by aiming at different audiences, I hope there may also be some mutually helpful things shared between from like-minded individuals who are in similar circumstances. This new system is going to be a massive change for many people/organisations, so it is imperative that everyone knows what they need to do and quickly learns the best ways of avoiding/dealing with disputes as soon as possible. I have been conscious over the past few years that many parents now also seek my advice on potential School/College placements for a child/young person with SEN. I do not normally recommend a placement unless I have seen it for myself personally so in recent years, I have tried to make the time to visit a number of schools. I have also seen that there are some parents or professionals around the country who want to attend my training but who cannot get to London for a number of reasons. A couple of months ago I was able to combine a visit to Kisimul school in Lincolnshire with my speaking at the Kyra conference the next day (my thanks to them both for making me feel so welcome). Kyra told me that it was easier for them to get me up from London rather than all their audience having to come down from Lincoln! This got me thinking. I now have had an idea that may help everyone (including me). I will now try and combine School/College visits and will offer to run a training session/day for parents/professionals at those I visit. Doing things in this way will hopefully be mutually beneficial to everyone and ultimately help more children/young people. If you would like me to visit your School/College and/or would like me to run a training session/day there, then please contact me personally by email or call my offices on 020-8349-7700 to get a date in our respective diaries. "I MUST BE DOING SOMETHING RIGHT!" I always try to end my updates with a light-hearted look at things that have happened to me, or share something from my personal life, such as my personal challenges as a disabled person, especially during the past few years when I have been riding a modified trike across countries like Sri Lanka, Madagascar and Israel to raise money for charity. I have also been fortunate to win some professional/personal awards in recent years. 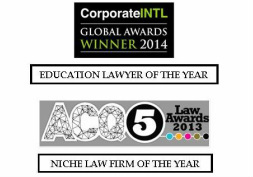 Well, I am delighted to tell you that this year I have been named ‘Education Lawyer of the Year in England’ in the Corporate International Global Awards 2014 and, at the end of last year, Douglas Silas Solicitors were named ‘UK - Niche Law Firm of the Year (Education)’ in the ACQ Law Awards 2013 (yes I know I could have told you this before!). It always gives me great pleasure to know that I am helping people but to be recognised nationally/internationally for it is even better. Finally, I should quickly mention here that I am now looking for a (newly/recently qualified) Solicitor to join my team. So if you think that you/someone you know fits the bill, please go to/direct them to go to our Vacancies page. P.S. I always find it helpful to find out what people think about these updates, so please take a few seconds to tell me what you think by going to ‘Summer 2014 update – your thoughts’ – there are just 3 quick questions.